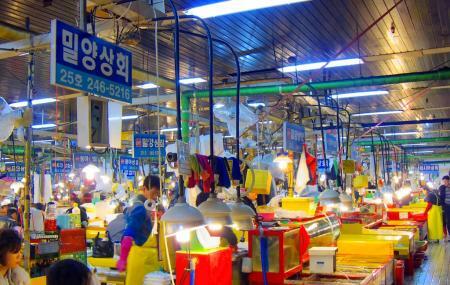 It is the largest fish market in Korea. Located beside Nampo Port, it is the only place where you can get fresh seafood, both in raw form as well as cooked. The first thing that will catch your attention is, most of the sellers are middle aged or married women. They are referred as Jagalchi Ajumma or ajumma. The prices of fish are quite cheaper as compare to other supermarkets. It is quite colorful and vibrant place to spend some time. In the indoor area, fish restaurants are there where you can taste different dishes, made of raw fish and live fish. There are many restaurants, where you can bring your own fish and they will cook it for you. If you are traveling in October, visit this market as it hold Jagalchi Cultural Tourism festival. Also, visit the popular attractions in the city by following Busan itinerary 1 day. Grab a sample of the seafood before buying it. Try out the indoor market place where each floor is dedicated to different areas of specialization. Try out the octopus but be careful while having it. At night, many pochangmachas and tent stands are open serving drinks and seafood in the outdoor area. At the outdoor section, pochangmachas and tent stands are open - 6:00 pm to 8:00 pm. Jagalchi station(Busan Subway line1), exit #10. How popular is Jagalchi Market? People normally club together Yongdusan Park and Paraeso Falls while planning their visit to Jagalchi Market. Great place for some of the best snow crab and seafood. The right way to eat it is steam. That's it. Only draw back of the place is if you don't speak or read Korean, it will be a tough time to communicate, and your choice is limited as some places do not serve tourist but only locals. Very unique place with assorted seafood. The fish spicy soup should not be missed. The BBQ squid along the street is a must try. The aroma of the sea will fill you up and if you are not use to wet market smell, you are in for a treat. If you are a bit squeamish, this place is not for you. This place is definitely something worth experiencing. They have a variety of seafood as fresh as it would be if you went put and caught it yourself. All of the vendors are located on the first floor and the restaurant is on the second. They also sell a variety of dried foods on this level. Worth the visit. Eating is all you do here and shopping too. Fresh fish as far as you can smell, this is the biggest fish market in Korea and second largest in Asia. It's pretty clean and you can also have your seafood cooked the traditional Korean way right on the spot. Try the fish cake, there is also a nearby walking street for shopping as well, you can spend a day or two here. Even if you don't like eating seafood, it's worth visiting this classic Korean seafood market to just look at the huge variety of fresh seafood. When I visited, the indoor market was closed off. Instead, I got to walk past the dozens and dozens of outdoor vendors selling everything from blobfish to huge chunks of tuna. There's several vendors who also cook and prepare your fresh seafood for you. You can enjoy your freshly bartered seafood right next to the ocean they were caught from.